Lasers like this can sometimes be converted to do any one of those wavelengths, or all three at once. Optics deck with cover on, pump diode visible. Close up of pump diode. Label power is 50W at 700-1000nm (it's 808). Haven't looked for any model numbers to confirm but my guess is that it's a 20-40W fiber coupled bar diode. Electronics section. Still need to figure out what everything is. 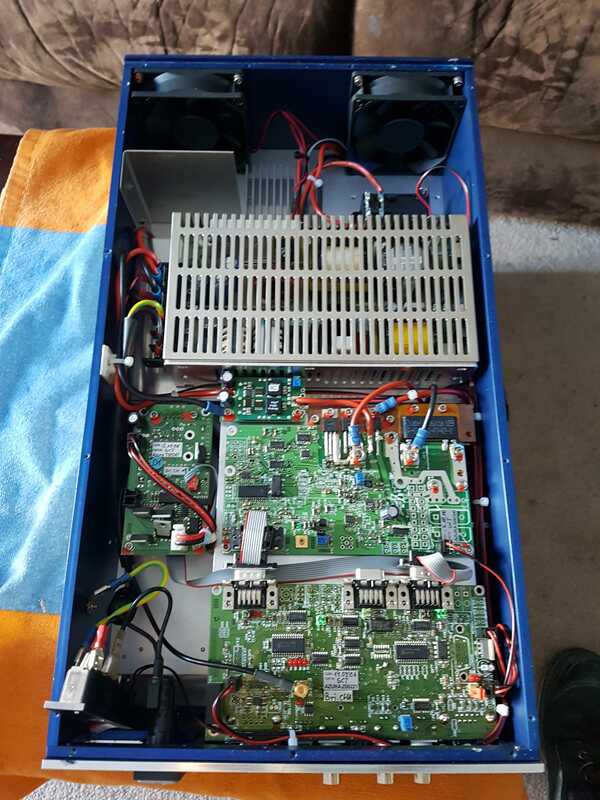 Large board at the bottom looks to be the controller/Q-switch driver. Large board at the top appears to be the diode driver. Didn't realize it was so big when I bought it, explains why shipping was nearly $100... Heavier than my argon and as long as my coffee table is wide. Key switch and power connector were busted up when it arrived, but don't hear any loose optics rattling around in there (phew!). Have the power connector swapped out already, need to bypass the key switch. After that I need to defeat the interlock and figure out what (if any) serial commands it needs, as well as any trigger signals. Will also need to open up the optics deck to look for any signs of damage and investigate the cavity - interested to see how that's set up. Impressive looking unit. I would be a little dismayed if I found damage to it, as that can be an indication of other damage you haven't found yet. If you don'y mind my asking, what did you give for it. I understand that shipping to your area is ridiculous. I hope it is in fairly good condition and you will be able to get it working. It was pretty well packed, but I'll just need to work on it and see if I can get it running. Hope I can get it working too. I'll post updates as I progress! At work for another hour and a half or so, going to tear into it as soon as I get home. PM incoming with my APO, AE address, it's a piece of junk, I will take it off of your hands for proper disposal. My favorite part is the soldering on those TO-220 parts. "The bigger the gob, the better the job"
If you could get some numbers off that main switchmode supply, that would tell you a lot more about what the pump diode is capable of. Yeah, had a little chuckle at that too. Those are a pair of 80A N-Channel power FETs, the larger component on the heatsink is the current sense resistor. Guessing the 2 pin TO-220 is a diode. Already looked at the supply, didn't see any labels. If there's any there they are on the bottom. Thanks! :beer: New FlexDrive arrived yesterday too FYI, may need to move this big thing off the desk just to get the 495 finished. Bypassed the interlock, as far as I can tell. Managed to get the big relay between the diode and the power supply to close, also had some lights change on the board. It didn't release its magic blue smoke so that's a good sign! Also repaired the AC power socket and replaced the key switch. Reattached the nuts for the BNC connectors too, so that's nice and secure now. So far, no serial communications. I'm going to need to figure out what's going on there, that seems to be what's holding me back. I noticed the RS232 port says "MODE/RS232", I'm wondering if they're using a non-standard pinout with some pin that sets the control mode. Thanks for the new photos and the update. Now that I can see more of it, much of what I was trying to picture in my mind is much clearer now. Good luck. $100 + shipping is an awesome deal for that thing! Can't wait to see updates on this, hopefully you get some output from it! I'd sure like to know how you came across that unit, I've been searching ebay fairly regularly for such things, never saw that one. BIG wires and buss bars indicate BIG fun. Need to pull the control board and take a look at the RS232 end to see if I can figure out what's going on. Maybe double check I didn't miss anything with the interlock. Getting ~1.35V across the diode, so I'm getting something from the driver at least, should be 1.8-2.2V for normal operation though. I actually came across a different unit before this one, it was the newer version of a similar system (SmartBeam II). Checked the seller's other items, as you do, and noticed he had this going at the same time. Good thing too, seeing as I didn't win the first unit (Bid $125, outbid by $2.50). Here's the listing I originally found, maybe that'll provide some insight. Yeah! Definitely some serious powers involved here. Agreed on the UV, don't want to mess around with it at these powers! Label power is of course higher than the true power, but that's still a lot of power at 355nm... Wonder what it'd do at 1064nm or 532nm. After spending some time checking the RS232 port to see if there was anything weird going on I decided to hook it back up to see if I could get anything from the RS232 interface. Had it all hooked up, ended up just mashing buttons and it gave me some German words back! Success!! A few minutes later I had the help screen up and had it all running. Also got the cover off earlier for a look at the optics and some pictures. Optics look to be in perfect condition, even after what seemed to be a rough journey. Next task is to remove the 1064/532nm filter, but first, pictures! Output filter, this part filters out the remaining 532/1064 leaving only the 355. Finally, my bench with everything hooked up. Signal generator for generating the external Q-switch signal (has internal too), scope monitoring the Q-switch output, monitor has serial connection and controls for the signal generator. Excuse the mess.